Who needs this course? Why take this Training? Driving Licence regulations changed in 1997. Until then once you had passed your car driving licence you could legally tow a trailer, horsebox or caravan irrespective of size or weight. Therefore drivers who have passed their test since this date may be limited in what they can tow, depending upon the vehicle and trailer combined weight, or individual weights of the vehicle and trailer. You may require a B+E licence to operate a combination of vehicle and trailer, caravan or horsebox. Many of our customers already have the entitlement to drive combinations where a B+E licence is required and don’t need to take a further test, but come to us to develop the skills and gain confidence before they take their own trailers, caravans or horse trailers on the road. Call us to review your current licence restrictions and arrange to upgrade your licence. Day 1 – Intensive training with Instructor. Day 2 – B+E DVSA Test. The course is reduced in time to 2 days by the student using his or her own vehicle, which saves on time and any difficulties incurred getting used to a different vehicle. 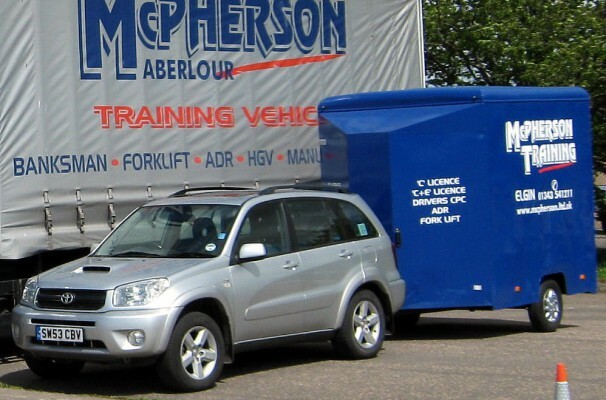 McPherson Training will supply the trailer used for training and the test, ensuring that it meets the specific DVLA requirements.